Enjoy your Craig David concert in style and comfort in our exclusive VIP area. 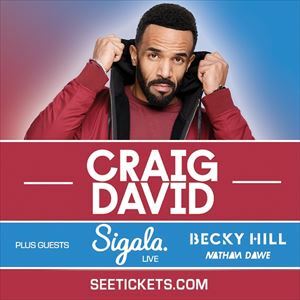 VIP tickets are now available across Craig David's 5 concert dates in Cheltenham, Peterborough, Colchester, Powderham and Dundee. VIP Package includes: -	Admission into the VIP Enclosure -	Platinum ticket -	Limited edition VIP laminate and matching lanyard -	VIP Fast Track Access -	Access to an exclusive VIP bar -	Premium toilet access -	Relaxed VIP seating The VIP area will be situated towards the side or back of the concert arena with VIP ticket holders also able to access the Golden Circle ticket enclosure. A variety food concessions will be available for VIP ticket holders to access in other areas of the concert arena catering for all dietary requirements. Price @ £130 plus booking fees. Access to a designated private bar and exclusive premium toilets. This is for Gold ticket holders only. This ticket can only be purchased with a GOLD ticket.